In these instances, Israel’s decision-makers have been faced with both political and moral dilemmas. All the while, they remain fully cognizant of the security risks posed to the Israeli public by such measures. Yet Israel decided on 17 August 2008 to unilaterally initiate the release of approximately 200 Palestinian prisoners, a decision that was realized the next week, with the 25 August release of 198 convicted terrorists. Among them were Palestinians serving long-term sentences for the murder of Israeli civilians; their release came at the personal request of Palestinian Authority President Mahmoud Abbas. Israel undertook this dramatic step in the hope of promoting dialogue with those pragmatic Palestinians who are both engaged in diplomacy with Israel (most specifically, the Annapolis process) and opposed to terrorism. Palestinians from many factions have often expressed their interest in seeing prisoners released. The 198 prisoners came from the ranks of those factions that support the leadership of PA President Abbas. Israel’s large-scale release of prisoners underscores its willingness to take confidence-building measures – and even make painful concessions – during those periods when the Palestinians are interested in maintaining an atmosphere of dialogue and negotiations. 1. This group of 198 released terrorists wasn’t the first. In August 2007, 255 were released to entice Abbas to at all palaver along with a further 87 in October 2007. In mid-December 2008 224 more terrorists were liberated. In all, some 1000 terrorists were let go to grease Abbas’s palms during 2007-8. 2. Many of the liberated terror-mongers set loose in order to foster confidence and goodwill quickly returned to their old murderous ways. 3. The Annapolis process – formally launched on November 27, 2007 – was the biggest and costliest Israeli diplomatic flop to date. It even eclipsed Ehud Barak’s colossal failures at Camp David and Taba because Premier Ehud Olmert and Livni offered even more than Barak’s already egregious offers. Olmert and Livni were ready to cede just about everything. Their risky generosity, though, changed nothing. They were rebuffed as gruffly as was Barak. Abbas plainly cannot do a deal, no more than his way more powerful predecessor Yasser Arafat could. Abbas won’t agree to end the dispute, relinquish the so-called right to inundate the Jewish state with millions of hostile Arabs or at all recognize the legitimacy of a Jewish state in the Mideast. Why? Because the object of Ramallah’s honchos was never to establish a Palestinian state but to destroy the Jewish state. All else is a ploy to debilitate Israel. But it’s not like Barak and Olmert cleverly demonstrated this truth to the watching world. They swayed no minds but they did create a new square-one for future haggling. Abbas already demands that all new talks begin from what Barak and Olmert were ready to surrender. That becomes a given, an already made concession that cannot be retracted, even if nothing was signed or traded in return. Olmert’s/Livni’s largess was as futile as the release of a thousand convicted killers for no other reason than to bolster Abbas in a self-deceptive bid to assemble a DIY peace-partner. When all this took place, Binyamin Netanyahu, who then headed the opposition, was outspokenly censorious of the gratuitous giveaways to Abbas. Now Prime Minister Netanyahu too makes superfluous payments Abbas – albeit on a smaller scale. There are those among us who have already decided that Netanyahu is in the midst of performing an Ariel Sharon-style sleight-of-hand. The accusers claim that another craven head of government has seen fit – for whatever quasi-cogent consideration – to cheat his voters. Although elected on a hawkish ticket, the suspected charlatan in fact implements the most dovish agenda. Superficially there’s cause for acute misgivings. After all, Netanyahu is faced with a second-term Obama administration that presumably finds nothing more pressing in world affairs than to twist the arms of the only stable democracy in the volatile and despotic Mideast. Then, adding angst to acute distress, there’s endemically Israel-bashing Europe which relishes any new pretexts to instigate boycotts against the Jewish state. To boot, Netanyahu heads a precarious coalition whose members are continually at cross-purposes with each other on an array of pesky issues, something which makes the PM particularly susceptible to all manner of ultimatums from within. Undeniably, Netanyahu is the poker player who was dealt a particularly atrocious hand, yet tries his darndest to stay in the game and pretend that that he can actually avoid losing. Pretense in itself is of course a disincentive to learning anything from the past. What if he’s not actually throwing more good money after the bad? Why should he be branded intransigent with all the disadvantages that piles up? The poker face Netanyahu seeks to put on is known in political terminology as pragmatism. He plays along in the hope that something will somehow improve his odds along the way. He needs time. His luck may yet change. It’s staggering stupidity to appear to own up, even if indirectly, to the rampant slander that has today replaced the medieval calumny of deicide. By repeatedly conceding the basic assumptions against us, we aggravate our own distress and inevitably succumb to the inimical international axiom that we’re in the wrong and that those who would annihilate us are desperate insurgents against injustice. Any means to which they resort are thereby legitimized and terrorism against Israel isn’t entirely cast out of moral bounds. Our accommodating pragmatism effectively removes Israelis, even Jews, from what the world’s anti-terror warriors define as terrorism. Insidiously, terrorism becomes the indiscriminate targeting of non-Jews. We’d therefore do better to go back to basics, proclaim loud and clear that we are in our historical homeland by right; that we were attacked; that the Arabs only conjured Palestinian nationality in order to stake rival claims; that a Palestinian state never existed (i.e. we certainly didn’t conquer and subjugate it); that we didn’t drive out hapless refugees (who themselves launched the war); that they caused their own downfall by plotting genocide and ethnic cleansing against us; that our only sin is surviving. We can even remind the world of the Nazi legacy of “Palestinian hero” Haj Amin al-Husseini. Admittedly, we may not convince anyone. The cards are stacked against us. But we’ve nothing to lose by rediscovering our defiant spirit and lost Zionist ideals. Excessive pragmatism – the sacrifice of national honor for temporary gain – will lose us everything, from our own sense of justice to the souls of our youngsters. It’s time to admit that Israelis are pathetically bad at poker, that we haven’t got the prerequisite steely nerves, that our anxious faces give us away. True, it’s hard to quit when losing, but that’s no reason to keep gambling with the very lives of this state’s citizens today and the survival of future generations. Poker, or what Obama/Kerry market as negotiations, can be a form of psychological warfare, a fact which behooves Netanyahu to remember that old casino adage: If you’re playing poker and look around the table to see who the sucker is, it’s doubtless you. Total agreement with you on this one Sarah. At least Golda had the “testosterone” to stand up to pressure, that leaders thereafter seem to lack. Not even one Jonathon Pollard for all the hoodlums now being released in this stacked card game. 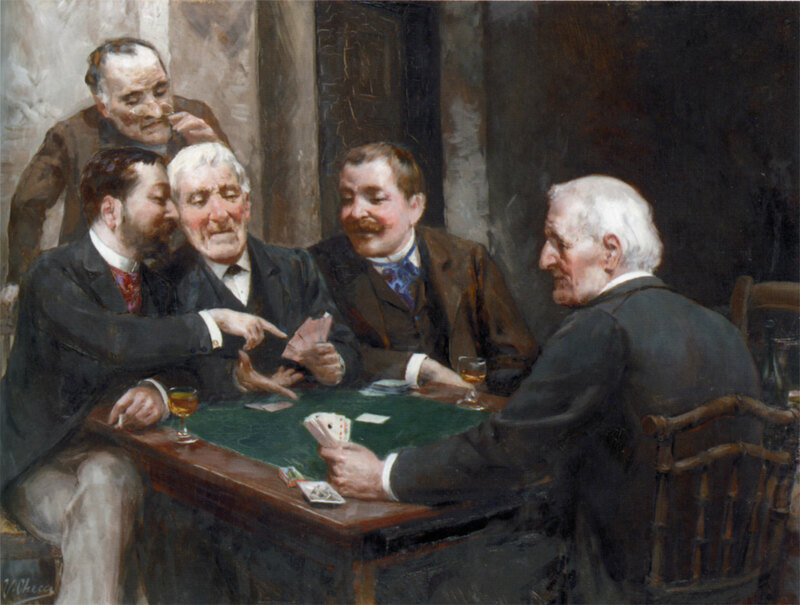 You’re right – Poker ain’t our game. These negotiations will only hurt Israel – whether they amount to anything or not. The odds and opinions by all participating parties are against us. “we’ve nothing to lose by rediscovering our defiant spirit and lost Zionist ideals”. Jews are good at asking questions to which they already know the answer. Like, why is this night different from other nights? Or, who is the sucker? You covered everything and you did an excellent job of it. did their bidding, gave them their money, marched to their graves. Or, if they had the means, they emigrated. Now have the strength to defend ourselves, to stand our ground. Otherwise we would already be gone. But strength, without the courage to use it, dissipates. Sarah, how much support do you have? How many Israelis heed your warning? Do you include the left wing deluded liberal intelligentsia of Israel who wish to make “kumbaya” with our enemies – or just normal pragmatic Israelis who want a secure border, to be left alone to get on with lives, and who realise that the sworn aim of Islam is the “total” destruction of “ALL” Jews everywhere? Yes Sarah, ZIONISTS are needed now more than ever ! FORGET about those wimpy pragmatists ! Bibi may be an old hand…but you dare NOT to play with the future of the Jewish state !!!!! About 5000 people die in Syria every month, but the snake Obama and his underling Kerry are hell-bent, to destroy the land of Israel…PLEASE WAKE UP FINALLY ! END THAT CHARADE N O W !!!!!!!! Unfortunately this is NOT a poker game. It is the very survival of a nation and, if I dare say it, a people. Israel is damned is she does release the prisoners and damed if she doesn’t so she may as well stand firm and no longer allow herself to be blackmailed into releasing murderers and thugs into the hands of those whose sole goal is the destruction of Israel and eventually the Jewish people. Obama, Kerry, and the EU would wring their hands and shed crocodile tears at the destruction of Israel and promptly return to business as usual. It is time Israel called the EU, US and arab bluff and did what has to be done. Stop playing poker with a losing hand and rediscover her “defiant spirit and lost Zionist ideals”. It’s a sure bet — even if we were to go back to the basics you lay out, so plain and clear, close to the end of this article — that we won’t convince anyone, for the simple reason that it’s hard even to convince a good many Jews of those simple basics. Far from merely falling on deaf or indifferent ears, such basics provoke howls of outrage and condemnation worthy of Haj Amin el-Husseini himself from a lot of Jews in my neck of the woods and congregation stateside. these 104 prisoners. (Besides the loss of national pride and the gradual erosion of Israel’s capital, concerning her right to exist, in the world court) I realize that mentioning that, and mentioning the word “Iran,” would have destroyed the premise of your article. Nevertheless, your article is a very useful one, because it shows very clearly the utter futility of being the proactive “peace” partner, when dealing the genocidal dregs of humanity that Israel has to work with, in these gab fests they call peace negotiations. You make very clear that the only way Israel might win in negotiations is if there was someone of integrity, say another Anwar Sadat, on the other side. Certainly Israel can’t win with Abu Mazen. And it was necessary to recount the times that Israel has previously released prisoners; because the world tends to quickly forget Israel’s sacrifices. Excuse me, I should have said that mentioning Iran, would have weakened the premise of your article, not destroyed it. I have to say that I admire Ms. Honig and turn to her column before anything else in the Friday JP but with all that, I can’t help but to remember Ms. Honig’s column a few years ago where she was lamenting the fact that Bibi was not our Prime Minister and was hoping that he very soon would be. I don’t think that Bibi was dealt such bad a hand. For a principled, resourceful and substance oriented leader, this would be an excellent hand! (By the way, it is a law of psychology that the dominant absorbs all peripheral energy – as per “an array of pesky issues” and the like …). 1) The art of selling the same thing twice and thrice. (Traditional Arab art). 2) The art of introducing completely inessential and external things as means of pressuring and camouflage. (Master Obama and his State Department). 3) The fine art of pretending to be offended and (as if) leaving the negotiations. Then reluctantly returning, if gained something. (Traditional Bedouin art). 4) The fine art of bluntly lying about atrocities committed by the other party (invented is OK). (The Chief Negotiator Saeb Erekat should give a master class). 5) The art of professing honesty and truth, immediately after introducing lies and distortions, to cover them up. (Instructor Obama, – or maybe Goebbels?). Thanks Sarah, the poker analogy is very appropriate. Sometimes every player in the game is aware of the con, except the one weak player who is the mark for the rest of them to feed off of. Neither is Bibi proficient at chess. He reminds me of a sucker player, who gladly takes pawns offered him (US aid) while overlooking the checkmate to Israel (Iran getting nukes). “power corrupts” we know, what we should learn is that “association corrupts”. If Bibi lives in a a virtual reality bubble, talking only to other politicians, he may acquire a disorder of thought. He may lose sight of the real reality. Or maybe he will come to his senses at the last moment, threaten to fire uncooperative generals, and attack Iran. None of the “pragmatic” arguments against intervention hold up under analysis, but to refute them might require discussion of options that run counter to conventional wisdom (and ideally shouldn’t be publicly discussed). Because the mainstream media, with no military aptitude, assume intervention must completely destroy all Iran’s nuclear facilities (to be considered successful). However, that is not necessary. During WWII, Hitler had built a massive fixed-place facility for launching V-2 rockets, featuring a bomb-proof dome similar to hardened underground bunkers today. However conventional bombing was able to destroy surrounding support facilities, whose destruction rendered the (virtually intact) central facilities useless. I could go on and on, (such as pointing out that a few missiles lobbed at their oil export facilities, their few refineries and storage of refined oil, would render Iran immobile and impotent to maintain an offensive or even a government).. I shouldn’t have to point this out, but MSM is so stupid and politicians won’t stand up to them. Plans should be kept secret, but if politicians aren’t going to implement anyway, such discussion causes no harm. One of your best columns, Sarah.Thank you for continually tyring to add some backbone – both to our politicians, and Jews and Israel-suporters everywhere.